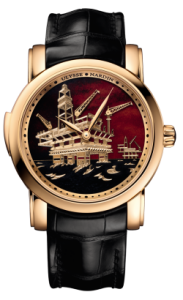 Ulysse Nardin is known for presenting some of the most spectacular Minute Repeater watches in the world, and this gorgeous one leaves no doubt as to why. This timepiece strikes the hours, quarters, and minutes. At the same time the three cranes will move as if to pump oil from the sea. 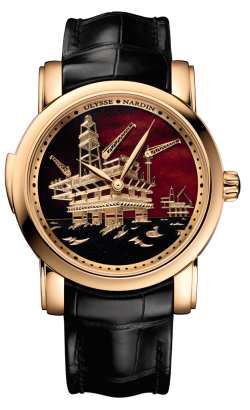 Limited to 18 pieces it is a 43mm red gold case, with glass exhibition back. Available on elegant crocodile leather strap with red gold folding buckle. PRICE $285,000 dlrs. To purchase this timepiece Call us 956.687.2981.